Notes on Dhamma has been variously described as 'arrogant, scathing, and condescending', as 'a fantastic system', and as 'the best and most important book on Buddhism ever written by a Westerner'. The Ven. 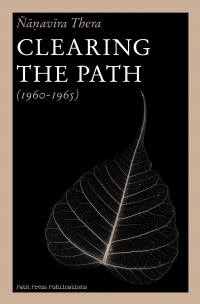 Ñānavīra Thera himself remarked of the book that 'it is vain to hope that it is going to win general approval... but I do allow myself to hope that a few individuals... will have private transformations of their way of thinking as a result of reading [the Notes]'. And indeed, the influence of Notes on Dhamma on Buddhist thinkers continues to increase more than a quarter of a century after its publication. Inasmuch as the first edition, long out of print, consisted of only 250 copies, how is it that this book has aroused such extraordinary interest and controversy? The answer, it seems, is to be discovered not only in the specific content of the Notes but in their general attitude, their view and direction. In describing that attitude their author wrote of the Notes that they 'attempt to provide an intellectual basis for the understanding of the Suttas (the Buddhist texts) without abandoning saddha (faith)'; that they 'have been written with the purpose of clearing away a mass of dead matter which is choking the Suttas'; and that, above all, 'the Notes are designed to be an invitation to the reader to come and share the author's point of view'. That point of view—achieved by the Ven. 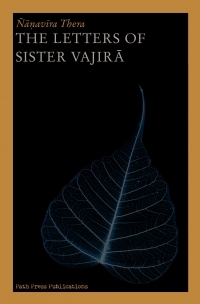 Ñānavīra through dedicated self-investigation using the Buddha's Teaching as a guide—is described unflinchingly in the Notes, which assume that 'the reader's sole interest in the Pali Suttas is a concern for his own welfare'. However, the Notes, with their admitted intellectual and conceptual difficulties, are not the only way to discuss right view or to offer right view guidance. The letters which are collected here are not only 'something of a commentary on the Notes'; they are, independently, a lucid discussion of how an individual concerned fundamentally with self-disclosure deals with the dilemma of finding himself in an intolerable situation, where the least undesirable alternative is suicide. With openness, calmness, grace, and considerable wit, the Ven. Ñānavīra discusses with his correspondents the illnesses that plague him and what he can and cannot do about them, and about his own existence. His life as a Buddhist monk in a remote jungle abode in not incidental to the philosophy he expounds: the two are different aspects of the same thing, namely a vision that penetrates into the human situation both as universal and particular, and recognizes that it is this situation which is the business of each of us to resolve for ourselves. In presenting this view the Ven. Ñānavīra offers a contemporary exposition of the Teaching of the Buddha. In living this view he evokes a dramatic situation wherein an individual resolutely faces those questions which every lucid person must eventually face. Clearing the Path is a work book. Its purpose is to help the user to acquire a point of view that is different from his customary frame of reference, and also more satisfactory. Necessarily, an early step in accomplishing this change is the abandonment of specific mistaken notions about the Buddha's Teaching and about the nature of experience. More fundamentally, however, this initial change in specific views may lead to a change in point-of-view, whereby one comes to understand experience from a perspective different from what one has been accustomed to—a perspective in which intention, responsibility, context, conditionality, hunger, and related terms will describe the fundamental categories of one's perception and thinking—and which can lead, eventually, to a fundamental insight about the nature of personal existence. Such a change of attitude seldom occurs without considerable prior development, and this book is intended to serve as a tool in fostering that development. As such it is meant to be lived with rather than read and set aside. These notions are developed more fully throughout Clearing the Path but it is as well that they be stated concisely at the outset so that there need be no mistaking who this book is for: those who find their present mode of existence unsatisfactory and who sense, however vaguely, the need to make a fundamental change not in the world but in themselves. The author wishes to make it clear that Notes on Dhamma is not a work of scholarship: an Orientalist (in casu a Pali scholar), if he is no more than that, is unlikely to make very much of the book, whose general tone, besides, he may not altogether approve. Though it does not set out to be learned in a scholarly sense, the book is very far from being a popular exposition of Buddhism. 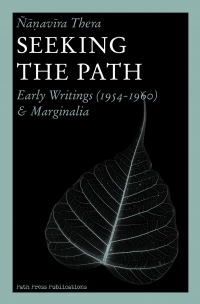 It is perhaps best regarded as a philosophical commentary on the essential teachings of the Pali Suttas, and presenting fairly considerable difficulties, particularly to 'objective' or positivist thinkers, who will not easily see what the book is driving at. From a publisher's point of view this is no doubt unfortunate; but the fact is that the teaching contained in the Pali Suttas is (to say the least) a great deal more difficult—even if also a great deal more rewarding—than is commonly supposed; and the author is not of the opinion that Notes on Dhamma makes the subject more difficult than it actually is. The difficulties referred to in this cover letter gave rise to extensive correspondence between the Ven. Ñānavīra and various laypeople who sought clarification and expansion of both specific points and general attitudes and methods of inquiry. The author devoted considerable energy to this correspondence: some letters run to five thousand words, and three drafts was not uncommon. From one point of view the Ven. Ñānavīra's letters may be seen as belonging to the epistolary tradition, a tradition refined in an earlier era when much serious philosophical and literary discussion was conducted on a personal basis within a small circle of thinkers. On another view many of the letters can be regarded as thinly disguised essays in a wholly modern tradition. Indeed, one of these letters (L. 2) was published some years ago (in the 'Bodhi Leaf' series of the Buddhist Publication Society), stripped of its salutation and a few personal remarks, as just such an essay. The author himself offers a third view of the letters in remarking that at least those letters which contain direct discussion of Dhamma points 'are, in a sense, something of a commentary on the Notes' (L. 53). In this perspective the letters can be seen as both expansions and clarifications of the more formal discussions in the Notes. Those who find the mode of thought of the Notes initially forbidding might profitably regard the letters as a useful channel of entry. 1) In the author's typescript the English translations of all Pali passages were placed in a separate section, after the Glossary, entitled 'Translations (with additional texts)', which contained the cautionary remark, 'These renderings of quoted Pali passages are as nearly literal and consistent as English will allow; but even so, they must be accepted with reserve.' These translations have now been incorporated into the main body of Notes on Dhamma alongside their respective Pali passages. 2) As a consequence of this, the section following the Glossary has been retitled as 'Additional Texts' and those texts (which are not quoted in the main body of Notes on Dhamma but are indicated therein by superscript numbers) have been renumbered. 3) In 'Shorter Notes' each subsidiary note appears as a footnote at the bottom of its respective page rather than (as the author had intended) at the end of the larger note to which it was attached. b) Additional Text 17 (Majjhima xiv,8) is quoted by the author as it is printed in the Burmese, Sinhalese, and Thai recensions as well as the P.T.S. edition; nevertheless the texts would seem to contain a corruption common to all of them (and therefore probably ancient) involving the word anupādā in both the first and the penultimate sentences quoted. No doubt these should read upādā (and the word 'not' would therefore be deleted from the translation of those lines). Anupādā in Sutta usage refers, apparently, only to the arahat's lack of upādāna. A puthujjana failing in his attempt at holding any thing would be described in different terms in Pali—perhaps as upādāniyam alabhamāno, 'not getting what can be held', or some similar construction. A parallel to the Majjhima passage is to be found at Khandha Samyutta 7: iii,16-18, where the reading is upādā, not anupādā. Although it is our place to note such points, it is not our place to alter them, and in this matter the Ven. Ñānavīra's text has been allowed to stand unchanged (as he quite properly allowed the Pali to stand unchanged). In the editing of the letters (which were collected during the first years after the author's death) no constraints such as those pertaining to Notes on Dhamma apply: considerable material regarded as superfluous has been pared away, and of what remains a certain amount of standardization has been quietly attended to, principally citation of quoted material. In keeping with the less formal structure of the letters Sutta references are cited in a less formal (but self-explanatory) manner than that used in the Notes. Books frequently quoted from are cited in abbreviated form. A key to those abbreviations is to be found at the head of the Acknowledgements. Where translations of French writings exist we have in most cases quoted the published version. (French passages were quoted in the original in letters to Mr. Brady, but herein English translations have been substituted.) 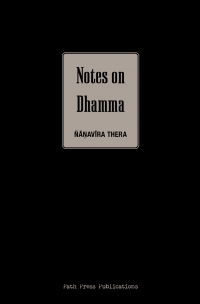 However, the translations provided by the author in Notes on Dhamma have been retained.